At first, I couldn't believe some of the brigands believed she was going to get intimate with them. Then I remembered that sometimes we guys just aren't that bright when it comes to that kind of thing... Capture from the Crunchyroll stream. 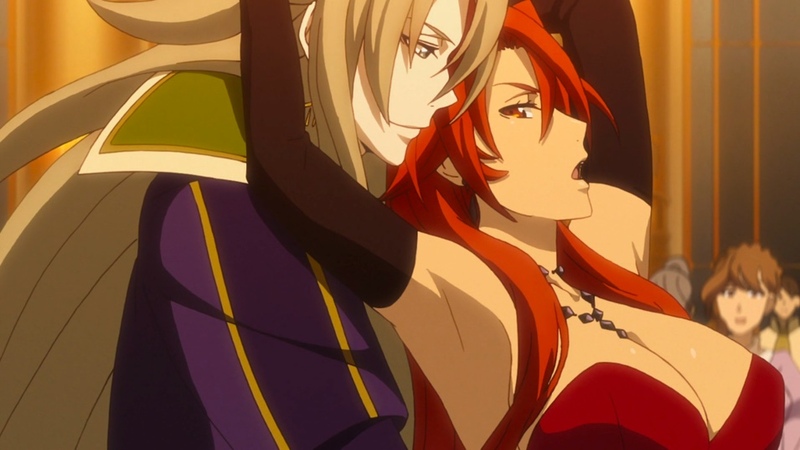 In Record of Grancrest War Episode 2, “Ambition,” Theo Cornaro tries to come to grips with the responsibilities of a Lord, and he’s still not sure how far to trust Siluca Meletes. After all, it’s not every day a talented and beautiful mage offers to hand you your dreams. Meanwhile, sensing potential weakness, the neighboring Lord David Lassic and his mage, Moreno Dortous, launch an attack. Can Theo defend his new territory? Can he trust Siluca to help him? And is that cat really wearing a cape? Did Siluca really have to act so surprised that Theo will willing to fight? Poor guy's ego has got to be taking a beating... Capture from the Crunchyroll stream. 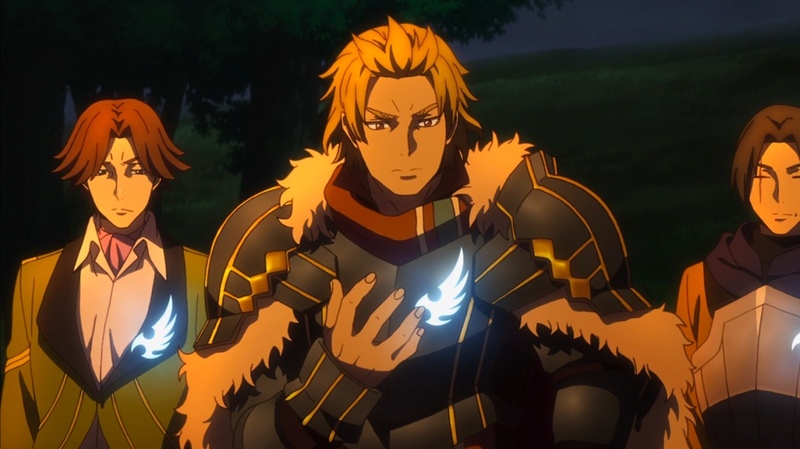 In Record of Grancrest War Episode 3, “Battle Flag,” Theo Cornaro and Siluca Meletes fight to stop a Salamander from destroying a local town. Even with with the help of Aishela and their new “friend” the priestess Priscilla, can they stop the rampaging Chaos demon from before it incinerates the city? After failed negotiations with King of Savis, Theo’s troops have to repel an invasion. Will the other Lords come to Theo’s aid? Or will Theo’s — and Siluca’s — ambitions die on the battle field? Flags and emblems can be powerful symbols. Theo uses his flag to unite his warriors and to symbolize what's important to him. Capture from the Crunchyroll stream. 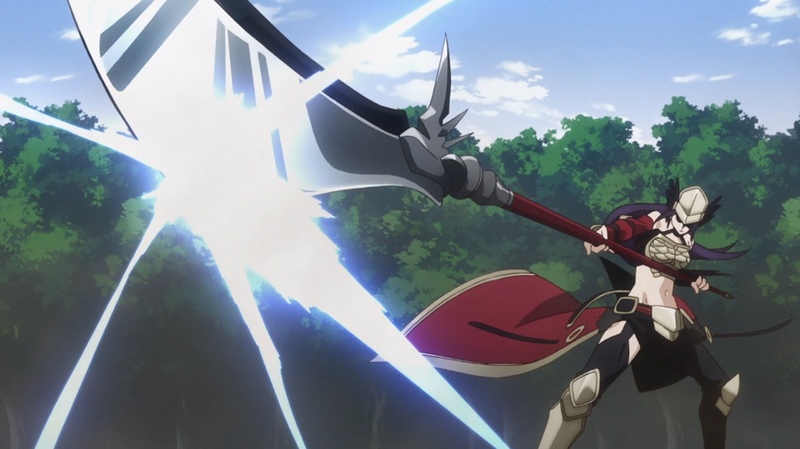 Aishela is enormously powerful. She's cleaned up until now. But when faced with a squad of powerful opponents? We got to see that even she has limits. Capture from the Crunchyroll stream. Clara asks Theo to take her daughters out of the forest. He promises. So where does he take them? Into his household -- in the forest! Oh, Theo... Capture from the Crunchyroll stream. 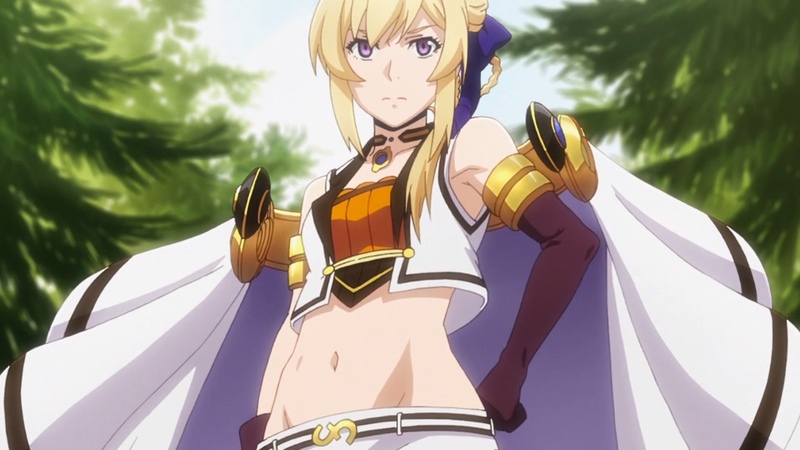 In Record of Grancrest War Episode 6, “March,” it’s Margaret Odius’s birthday, and Villar Constance remembered! 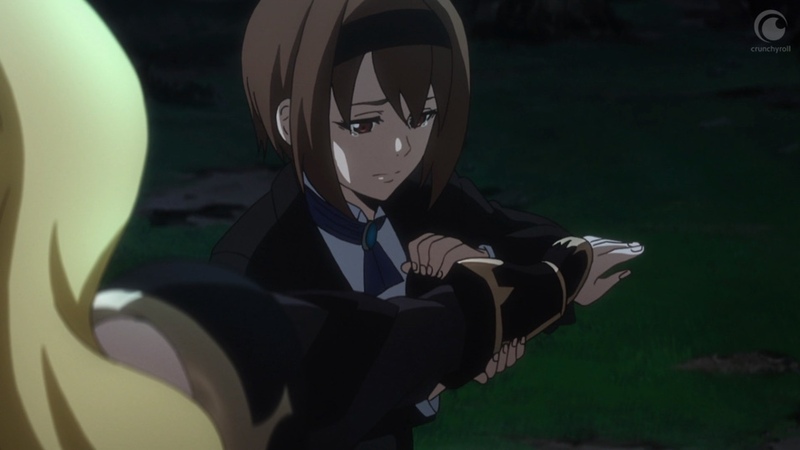 So why is she so sad? Lord Milza continues to scorn Theo Cornaro’s philosophy of life, and they come to blows. Will Theo survive the fight? And will Siluca Meletes’s heart survive watching it? 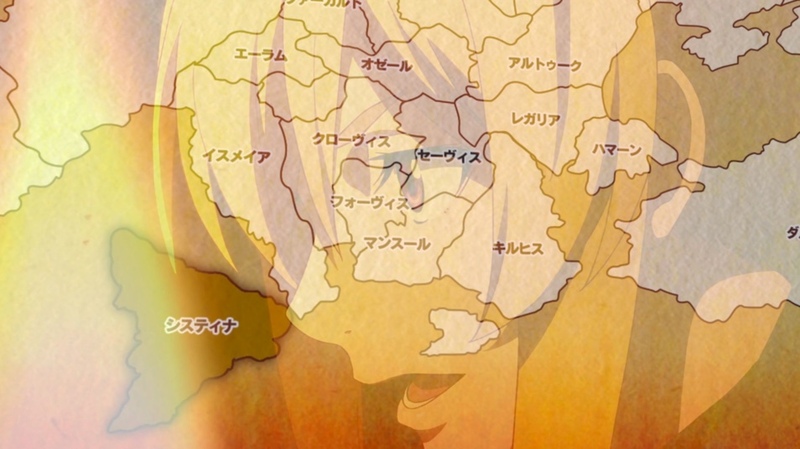 Finally, Milza decides to attack a castle by himself. How well do you think he fares? Does he really support Lord Villar’s ascendancy, or does he have plans of his own? We've seen a lot of combat. In this episode, we saw a different kind of effort: actually decent dancing! Capture from the Crunchyroll stream. 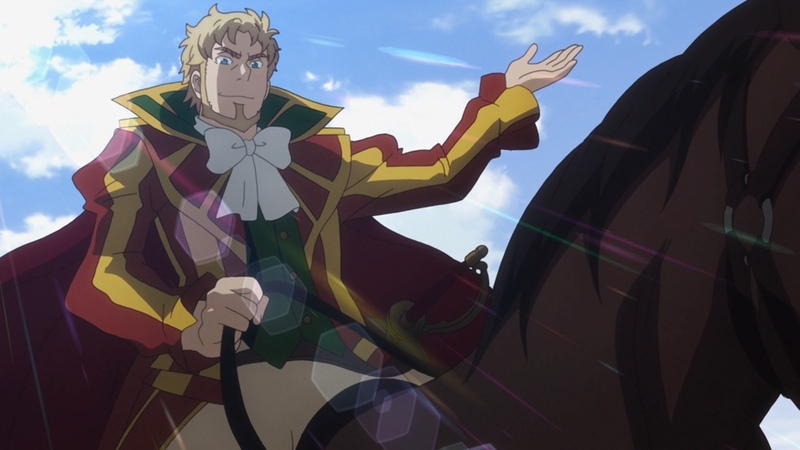 In Record of Grancrest War Episode 7, “The White Prince,” it’s Theo Cornaro’s turn to attack a castle by himself. Will he do as well as Milza in episode 6 — with a similar body count? Or will he find a different path? Later, at a celebratory banquet, Theo meets Lord Pederico Rossini, the corrupt ruler of Sistina, his hometown. Will Theo let him live? And how will Rossini react to the name “Cornaro?” Finally, an unexpected visit turns deadly as Theo and his household have to fend off an attack. Can even the combined strength of Theo, Siluca Meletes, Irvin, and twin combat werewolf maids push back so many attackers? 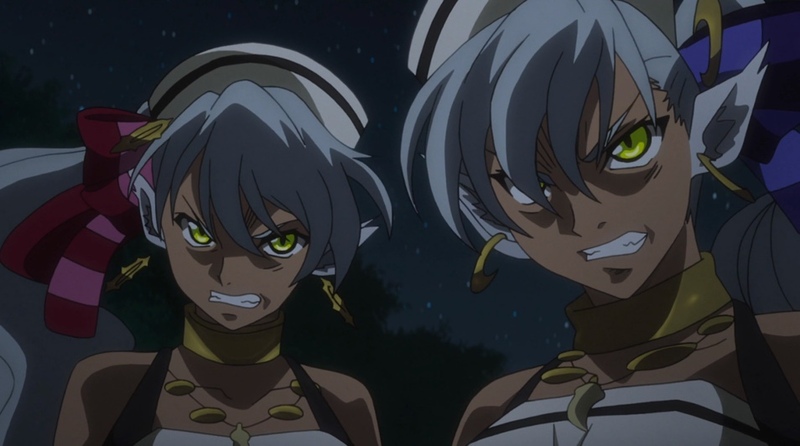 I got to see the twin werewolf combat maids in action -- and wow, they are lethal to their enemies! They have great teamwork, too! Capture from the Crunchyroll stream. 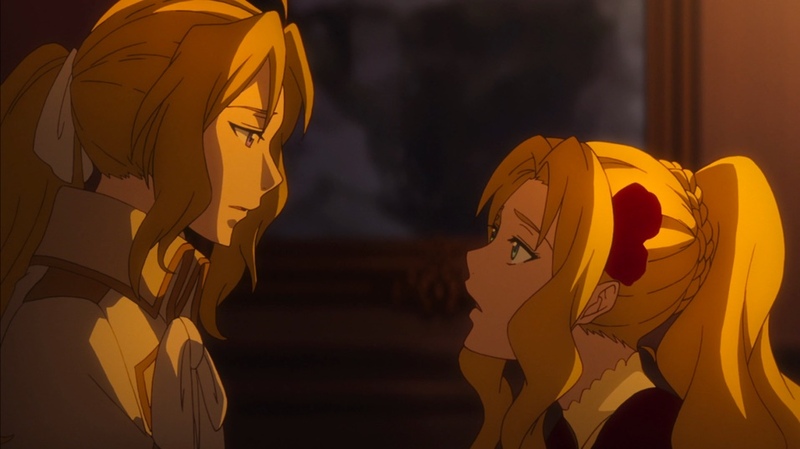 In Record of Grancrest War Episode 8, “The Congress Dances,” a flash-back shows the lengths to which Alexis Douse, the Prince of the Sun, went to win the heart of Marrine Kreische — so why does she rebuff him now? Villar Constance makes his move in the congress, and Theo Cornaro provides impeccable support. But a short-sighted Lord and his followers vehemently oppose Villar, with Alexis’ unwittingly help. Can Villar and his faction seize the opportunity to strike the Alliance? Or will the chance elude them? Alexis looks so crestfallen that Marrine can't help but kiss him. I guess that's one approach to winning friends! Capture from the Crunchyroll stream. 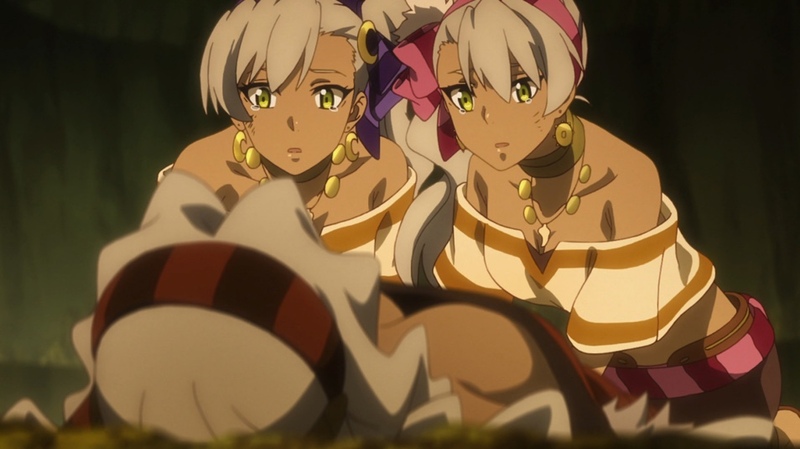 In Record of Grancrest War Episode 9, “The Black Princess,” Villar Constance tries to show patience and restraint when it comes to a campaign against the Alliance, but some of the Lords under him, as well as Mirza Kooches, decide to take matters into their own hands. To take Siluca Meletes’ mind off the matter, Theo Cornaro asks her to join him on a tour of his domain. What will happen when rain traps them — alone — in the wilderness? And why has Marrine Kreische asked for a meeting with Mirza to talk about an alliance — and what will he charge her? 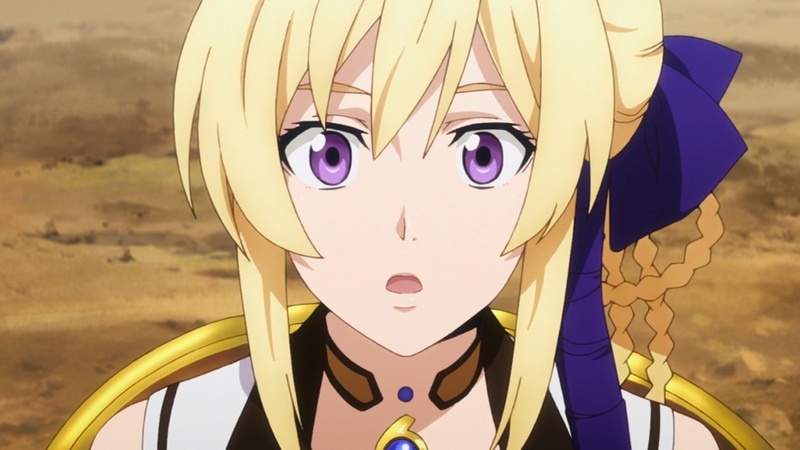 In Record of Grancrest War Episode 10, “Blade of Betrayal,” Marrine Kreische and her forces invade the Union, putting pressure on Villar Constance, his troops, and his mages. Meanwhile, Theo Cornaro and Siluca Meletes rally as many of the surly townsfolk as they can in an attempt to hold off one another group of Marrine’s forces. Will Villar realize in time that Mirza Kooches is a betrayer and is even now leading a fleet to assail him? And who’s the solitary figure in a boat racing to arrive before Mirza’s fleet? Alas, poor Solon. We didn't get to know you at all! And you seemed like such an interesting character... Capture from the Crunchyroll stream. What grace, power, and beauty in the face of despair. I'm going to miss Margaret. Capture from the Crunchyroll stream. 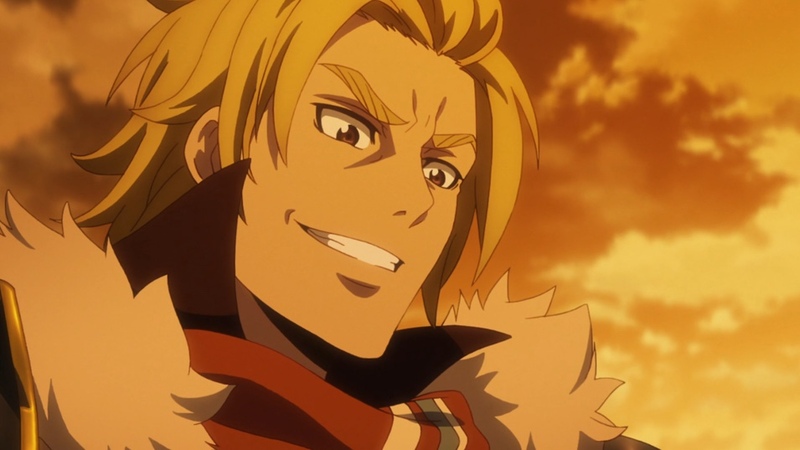 In Record of Grancrest War Episode 12, “A Treaty Formed,” Mirza Kooches cannot understand why the subjects of the now deceased Villar Constance won’t just stand down and accept the change of leadership. David Lassic literally puts his neck on the line in an attempt to help the tyrant understand. Marrine Kreische takes an interest in Theo Cornaro and Siluca Meletesand insists on meeting with them before trying to wipe them off the face of the Earth. The meeting gives Theo an idea for an innovative new kind of attack! David was almost as excited about facing off against Mirza as the reverse! Loyalty and courage -- that's an admirable combination! 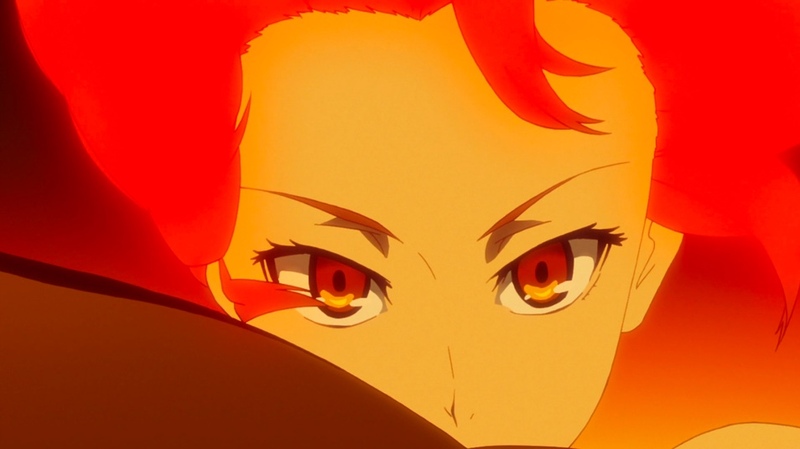 Capture from the Crunchyroll stream.